Egypt's deadliest terrorist group has claimed the killing of six policemen in a roadside bomb in the Sinai Peninsula, where security forces frequently clash with jihadists. The Al-Qaeda-inspired group posted a video late Tuesday on Twitter showing the bombing hours earlier of a security convoy on a road between the North Sinai provincial capital El-Arish and Rafah on the Gaza border. An armoured personnel carrier (APC) is seen flying into the air while a militant shouts "Allahu Akbar (God is greater)". The video was also posted on YouTube along with the group's logo of a black flag, an AK-47 assault rifle and an open Koran. Ansar Beit Al-Maqdis has carried out some of the worst attacks against Egyptian security forces in the peninsula and other parts of the country since the ouster of Islamist president Mohamed Morsi following last year's 30 June protests. Hundreds of police and army personnel have been killed by jihadists since Morsi's ouster. The police and army have launched a massive operation in Sinai to crush Ansar Beit al-Maqdis, killing scores of militants including several of its leaders. 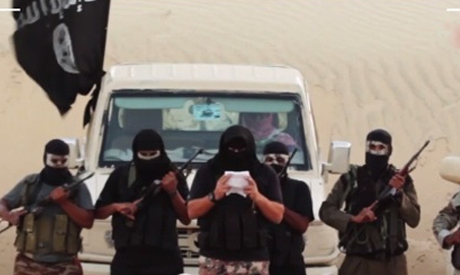 The group claimed a bombing earlier this month in Sinai that killed 11 policemen. It also recently expressed support for the extremist Islamic State group that has seized swathes of Iraq and Syria.